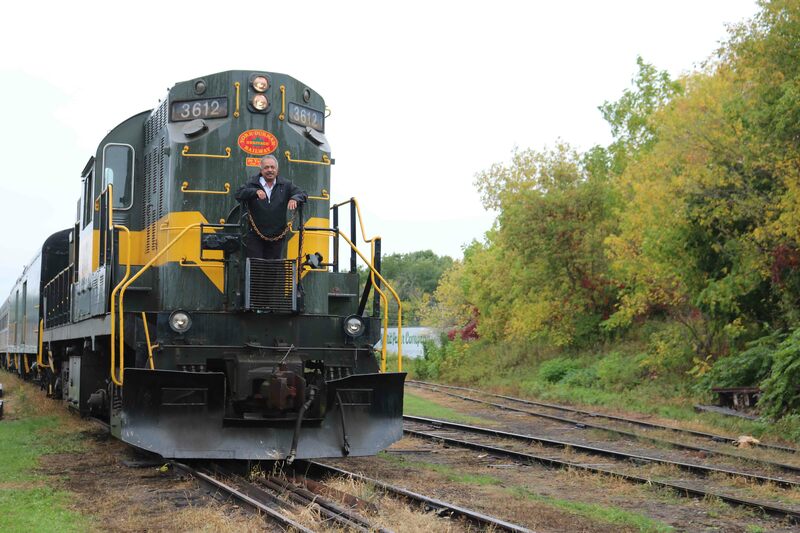 On October 1, 2016, we embarked on the York-Durham Heritage Railway train on a trip around the city of Uxbridge, about an hour’s drive from Toronto. 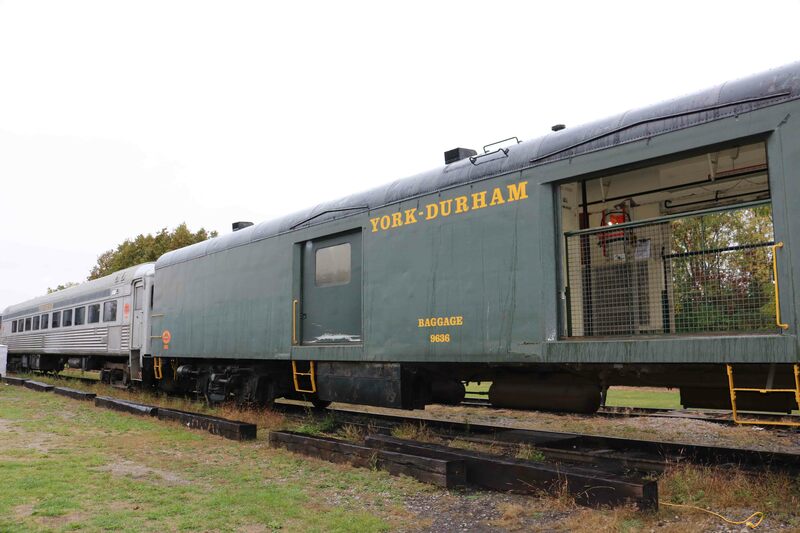 The York-Durham Heritage Railway trains operate on the original Toronto & Nipissing (T&N) rail line, built in the late 1860’s. This line was built to allow its owner, William Gooderham, a distiller from Toronto, to carry grain to his distillery as well as lumber. On March 4th, 1868, the Company was chartered and construction began the following year. As it was advantageous at that time to have the rail line pass through any town, many paid handsomely for the privilege. Markham raised over $4,000 in one evening, and Unionville made a successful last minute effort to have the line rerouted after it bought $500 worth of shares. The town of Uxbridge was chosen for the site for the railway’s shops. 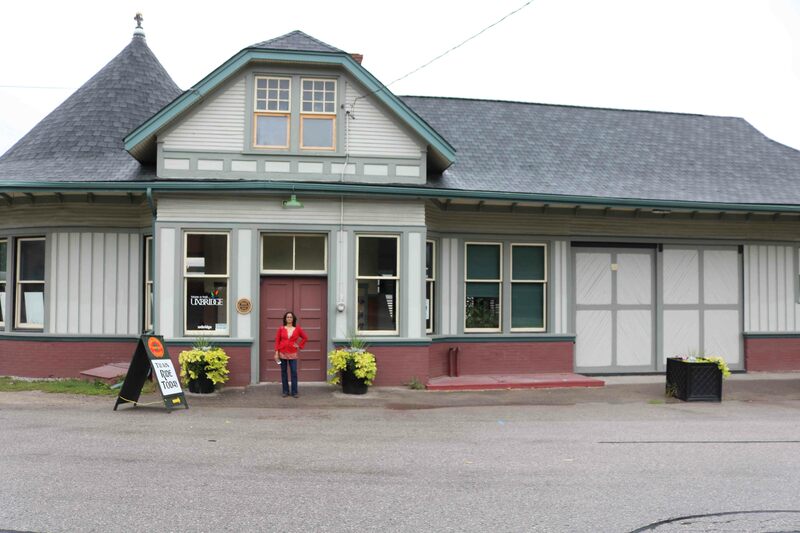 We reached the Uxbridge station, with its distinctive “Witches Hat” roof, owned and maintained by the Township of Uxbridge for the heritage journey. Uxbridge is situated in a beautiful valley on the northern slope of the Oak Ridges Moraine, about 64km northeast of Toronto, Ontario. 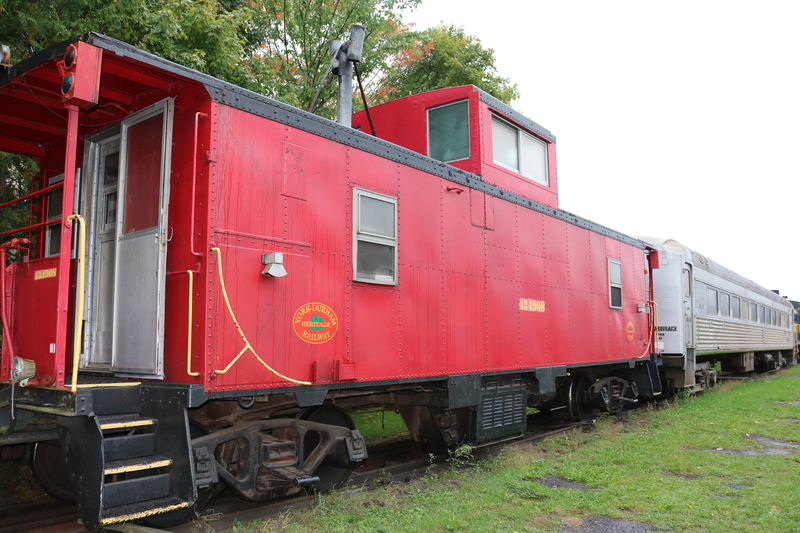 The York-Durham Heritage Railway reopened the line between Uxbridge and Stouffville in 1996 and has been running on summer weekends since then. The train journey of about 90 minutes. 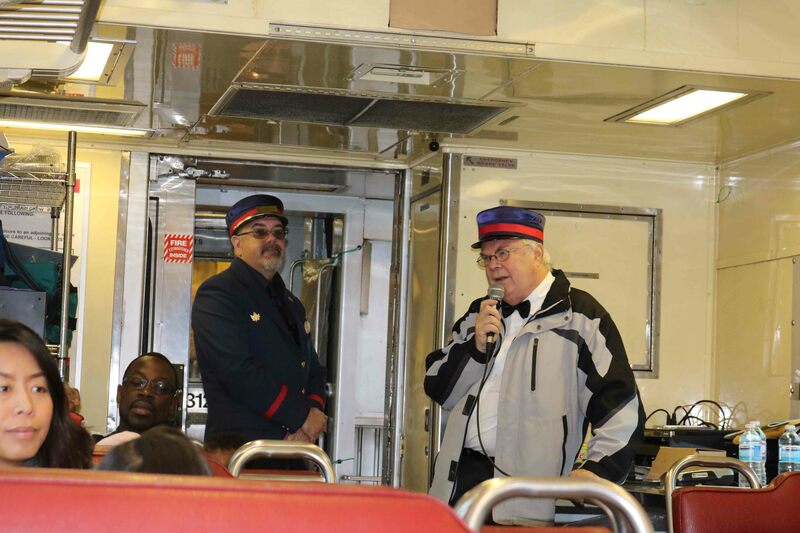 After we boarded the train, the Captain of the train – the Conductor – briefed the passengers about the train and its journey, what to see and do with the coach attendant watching. All the staff running the train are volunteers. 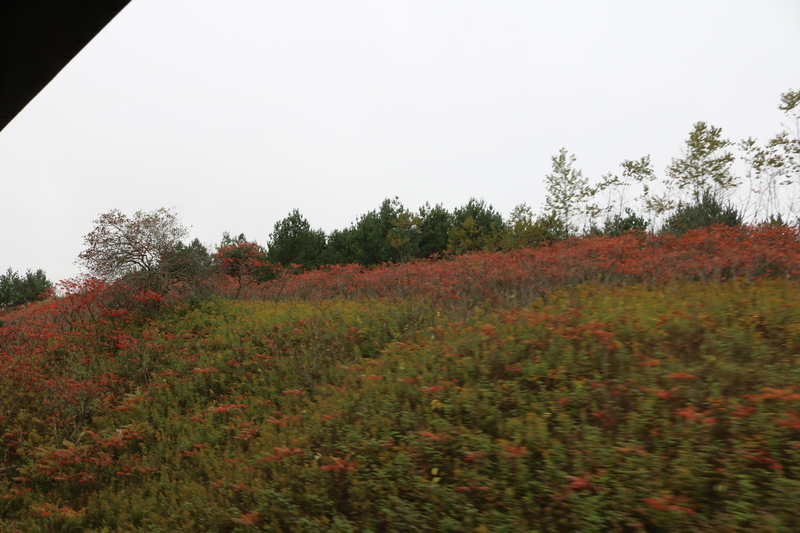 The fall had set in (01 Oct) and the leaves were changing colours – before they fall off. This gave a kaleidoscope of colours all through the journey. 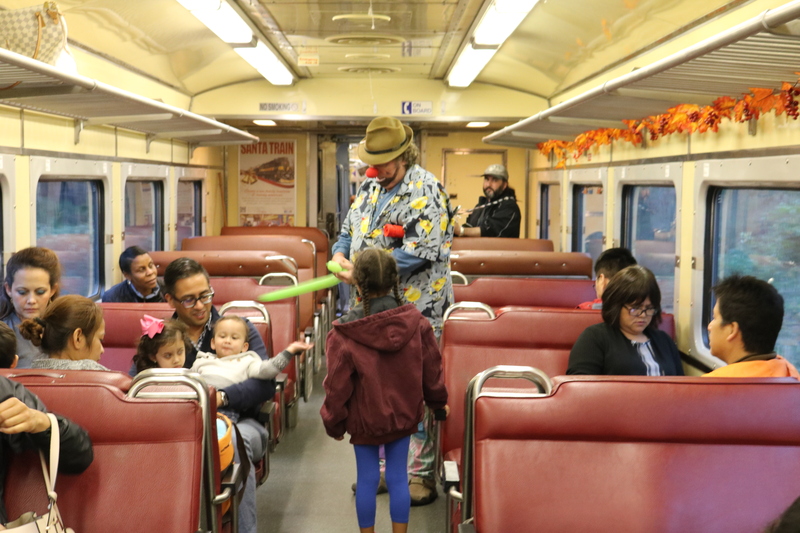 The Baggage Car with open doors fitted with safety barricades is the best place to view the landscape while the train is on the move. 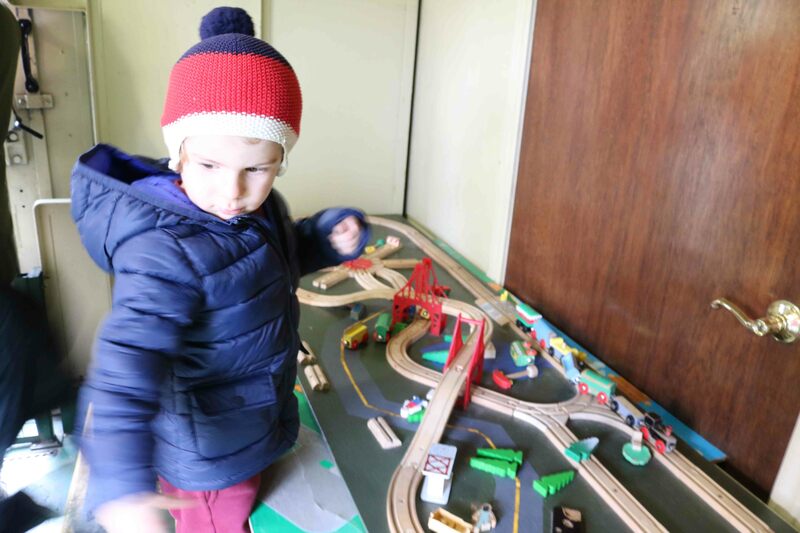 One side of the Baggage Car is a ‘Railway Play Station’ for kids, to keep the kids engaged all through the journey. 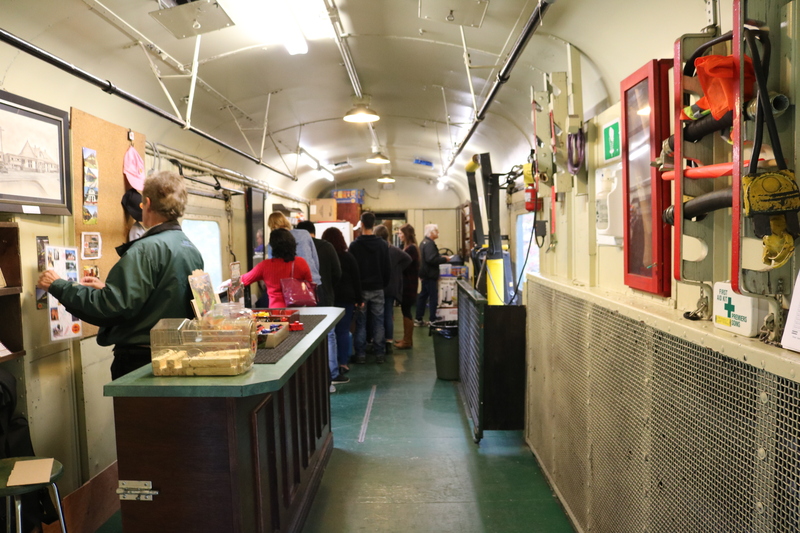 On the other side of the Baggage Car is the Souvenir shop and a snack-bar – all manned by volunteers. 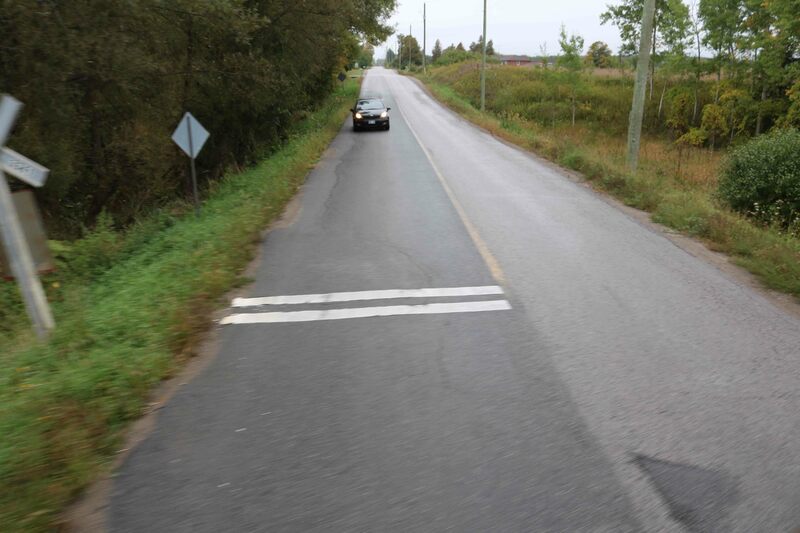 The rail-road crossings do not have barriers like those along an operational rail line as the trains operate only on weekends. It is the duty of the drivers who cross the railway line to lookout for approaching trains and stop. 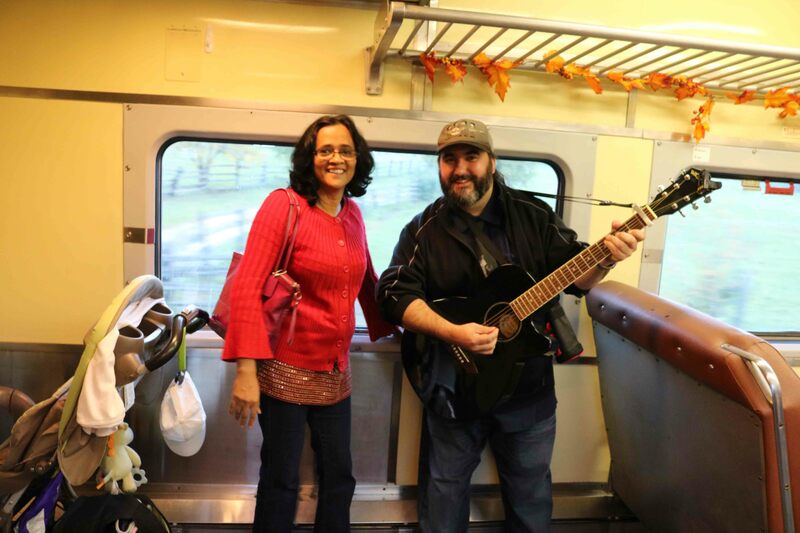 A musician, again a volunteer, entertained the passengers with his melodies. The passengers also joined him in chorus. This is a lime stone quarry enroute of LaFarge Cement Company. 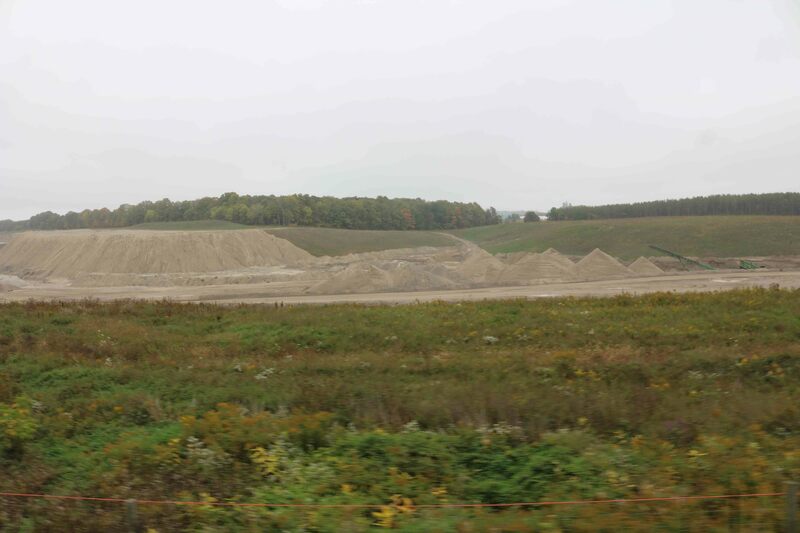 Ontario has large deposit of limestone which supports the large cement manufacturing industry. 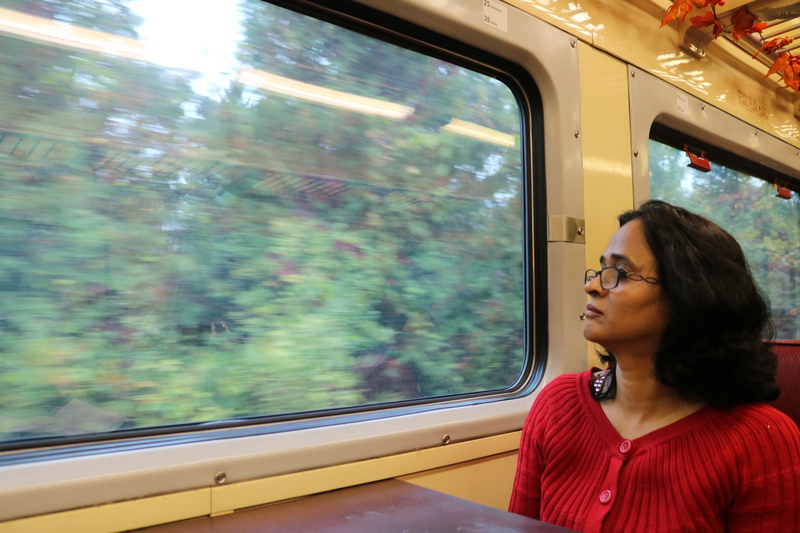 The journey was very pleasant, especially with the friendly, easy – going volunteer staff. The staff obviously loved what they did. It is an experience worth sharing as it goes to prove that a volunteer force can run a railway and much more. Ooh ! Enjoyed reading this. I’ve added this to my todo list as well! I notice you got on at Uxbridge, but did you get off at Stoufville?? good journey. I am sure you will also be a volunteer crew one week end. t hanks Reji, I love Canada for all it”s goodness.